The Porsche Boxster 718 is one of the most successful and controversial sports cars to hit the market recently. Upon its debut in 1996, many Porsche purists saw its water-cooled engine and mid-engine layout as an affront to brand’s iconic rear-engine, then-air-cooled 911 flagship. 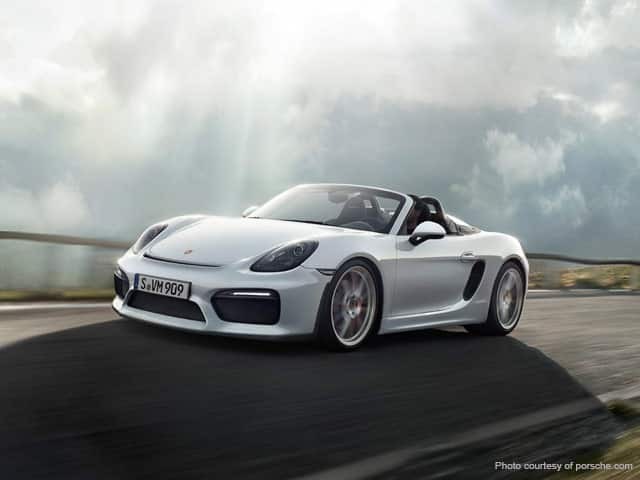 At the same time, the car’s supporters praised the first-generation 986 Boxster for its superb driving dynamics and effervescent personality. 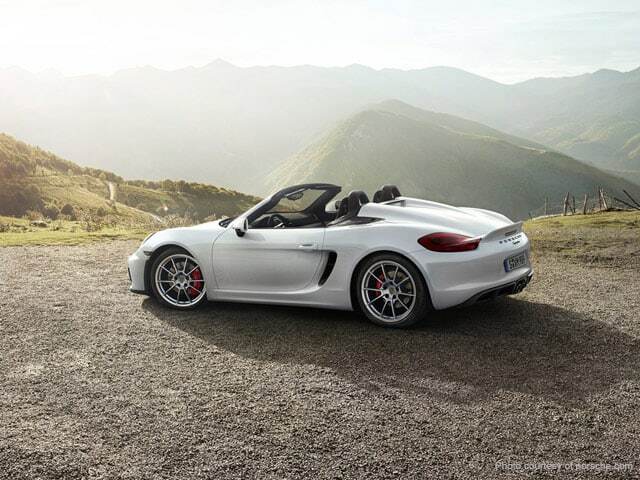 The Boxster is now in its third generation. For 2017, Porsche gave the roadster and its sister model, the Cayman Coupe, new names. The duo are known as the 718 Boxster and 718 Cayman in reference to the four-cylinder 718 race cars that Porsche campaigned in the 1950s and ’60s. I was excited to find the latest version of the sports car waiting for me at the airport on a recent trip to Atlanta — home of Porsche Cars North America. And what a sight to behold! A 2017 718 Boxster S in agate grey metallic livery with a red retractable convertible top. For many years, fans of the car have asked Porsche to unleash the beast and introduce a Boxster Turbo. Porsche refrained from doing so for a variety of reasons, ranging from protecting the iconic 911’s performance supremacy to the challenges of cooling a turbocharged flat-six inside the Boxster’s compact engine compartment. The new turbo-four, developed at the greatest expense by Porsche, especially for the 718, comes in two flavors. The base 718 gets a 2.0-liter version with 300 horsepower, while the S variant gets a 2.5-liter unit with 350 ponies. 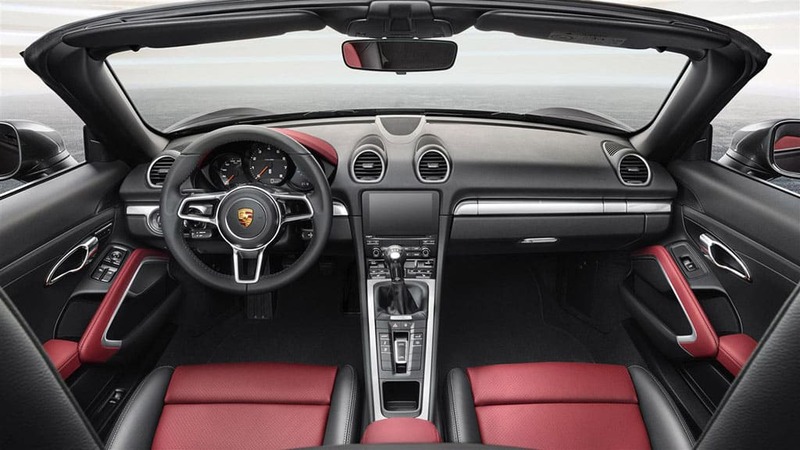 Both turbo fours come standard with an old-fashioned six-speed manual; the seven-speed Porsche Doppelkupplung (PDK) manumatic transmission is available as an option. Overall, the Boxster’s looks are, well, unmistakably Boxster. For 2017, Porsche refreshed the aesthetics of the third-generation Boxster with some tweaks. Updates to the front and rear fascia — including new LED headlights, redesigned vertical front intakes, and modified rear deck lid — are subtle but tasteful alterations to an already attractive design. Inside the cozy cockpit the driver is treated to a fine blend of style, luxury, and utility. Our tester came covered in a lush Bordeaux-red leather — a $2,950 option — tastefully off set by metallic accents. The Boxster’s well-bolstered vented seats offer solid support in the corners while proving themselves to be remarkably comfortable on longer drives. The new 718 is fitted with the latest generation of the company’s PCM infotainment system, running through a seven-inch touchscreen display. The new PCM system’s user interface, functionality, and responsiveness are significant improvements over the outgoing version. With that said, it’s still not quite as good as the best systems from GM, Ford, and Porsche’s corporate sibling, Audi. Fortunately, PCM now features full Apple CarPlay and Android Auto integration — a feature of which I made abundant use.